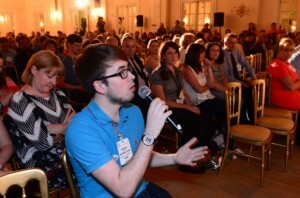 Hot on the heels of Bristol, the Civil Service Live bandwagon pulled up in Liverpool's Adelphi Hotel for a jam-packed day of networking, stands, workshops and some tough Q&As in the plenary sessions. You can find all the social media reaction on our storify round-up, the Flickr album from the day, or just check out our debut vine featuring one of the trainee prison search dogs saying 'hello'. Finally, today was the anniversary of the creation of the iconic 'Keep Calm and Carry On' poster, and the history blog revealed the compromise behind the slogan.